So we found out yesterday that football was not coming home. Cue mass outrage from every Englishman and woman who are interested in football, cries of corruption and the finger pointed firmly at the British Press. I was one of these people and I still am. I am outraged that England are not hosting the 2018 FIFA World Cup but not as outraged as I was at the time. I have sat back and tried to think rationally about this trying to answer the question that crosses everyone’s mind after something has not gone to plan…Why? First off, I do not blame The Sunday Times or Panorama I want to, my god I want to, but is having anything in this country worth taking away the freedom of the press? I hate a lot of what goes on in the press but our press and the freedom they have to report on anything they want is part of what makes England a great country. The timing of the Panorama show was questionable but there really wasn’t any new allegations made, it was all rehashed. Secondly, the Russians and the Qataris have endless money to throw at these World Cups while we do not. Yes we already have the infrastructure needed to host a World Cup, and we can host one tomorrow but FIFA are looking to develop football in countries that don’t necessarily have the greatest football following. This is a massive risk because I’m sure a South Korea V Greece game in Russia or Qatar will mean a half empty stadium and that does nothing but hurt the spectacle that is the World Cup. Also, the stadiums that are built specially for the month of the World Cup, what will happen after the event finishes? Will they stand empty to fall into a state of disrepair due to the lack of top flight football in these countries? More than likely, but money is no object to these countries and that is their right. The main reason that we did not win was down to Sepp Blatter, FIFA President. Sepp is a very ambitious and egotistical man. When he finally leaves the post of FIFA President he wants to be able to say to people “I took the World Cup to places it had never been, that is my legacy”. The first World Cups in Asia and Africa have been staged under his leadership and now we have the first in the Middle East and Eastern Europe (I still don’t see how Russia is Eastern Europe, surely it should be Asia?!) There is nothing that England can do in the eyes of Blatter, England are not even on his radar. He wants to spread the gospel of football around the world like a maniacal priest and he has the power to do that. I have now come to terms with where 2018 and 2022 are going to be held, and good luck to both countries. I’m sure the events will be spectacular. With all that money behind them they better bloody well be. 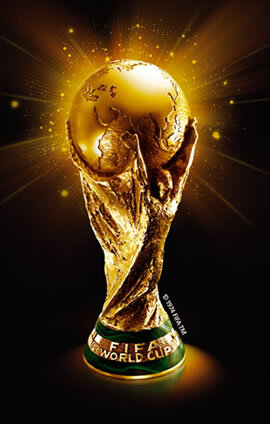 Let’s now get behind your team, your country and support your nation, there will be no bigger kick in the face to Blatter than your team taking the cup home. I can handle it being given to Russia, Blatter’s ego mania / God complex is well known, but it’s not as simple as taking a big tournament to a new country. There are three main reasons an Eastern European nation hasn’t hosted a major sporting event, a lack of; money, logistics / infrastructure and public support / demand. Russia has now has ONE of these only. I fail to see how taking the event to the world’s largest country does anything but line the pockets of those in political or financial power there. How can you expect the average Russian family living on the Pacific Coast to be in any way impacted upon? Are they going to build 40k+ elite level arenas in an area with a population of less than that amount, or where -20 degrees is a warm day?! If not then will they supply free travel and drastically reduced ticket prices for the Russian population, huge amounts of which are living in poverty. There are so many sides to this one. Russia aside, I can’t understand how the England bid was beaten by lacklustre and again, poorly supported Ned/Bel and Spa/Por bids. If it is a backlash by FIFA officials against the British media then maybe this is the real reason for Russia and Qatar. There certainly won’t be any investigation in to FIFA’s organisation and running in Russia or the Middle East, hardly two hotbeds of free speech or active democracy. I just hope those that can go after FIFA do and find out how the world’s favourite sport is actually run. I think we’d be horrified if we knew the half of it. Let’s not forget one thing, that the major sporting events like the World Cup and the Olympics are no longer SPORTING events. They are corporate events first and foremost. Just look at China bull-dozing areas of Beijing and forcible evicting thousands to make way for luxury hotels; or a higher percentage (per capita) of complimentary tickets than real fans at South Africa 2010; or the franchise take over of every single London Olympics site by MacDonald’s and Coca-Cola. De Coubertin would be ashamed.